The annual International Sikh research Conference (ISRC) 2017 highlighted the contribution of scholars to the study of Sikh studies. Convened by Harjinder Singh Lallie and Gurinder Singh Mann at the University of Warwick, a number of researchers from around the world shared their unique contributions to the study of Sikhism through a wide range of papers. With contributions from scholars from Canada, Ireland, India and Pakistan as well as seasoned scholars from the UK. Dr Jaswinder Kaur Dhillon (University of Worcester) started the proceedings off with her paper on how Sikhs in the UK had improved their social position within the UK since settling in the UK. Harjinder Singh Lallie (University of Warwick) using many data sets and reports showed how Gurdwara Governance was falling short of what was expected. Guru Fatha Singh Khalsa (University of Toronto) explored how yoga and the recitation of Jap could improve one’s personal wellbeing. The second session was started by Katherine Joy Dowds (Trinity College, Dublin) who gave an important account of how Sikhs were represented in Ireland. Vijayta Mahendru, (Jawaharlal Nehru University, Delhi) spoke about hate crimes and the Transnationalization of the Sikh Identity. The third session started off with Rav Singh (A Little History of the Sikhs) highlighting the Anglo Sikh history on the streets of Kensington, London, this was followed by Dr Jasjit Singh (University of Leeds) looked at how the Radicalisation of Sikhs had been exhibited through the media past and present. The fourth session was started by Dr Robina Shoeb, (University of the Punjab, Lahore, Pakistan) who highlighted how educationally rich the Punjab was under the leadership of Maharaja Ranjit Singh. This was followed by a brief discussion by Dr Sujinder Singh Sangha, Dr Raminder Singh and Professor Eleanor Nesbitt (University of Warwick) who gave their views on how Sikhs and Sikh studies had progressed since they started working in the area. 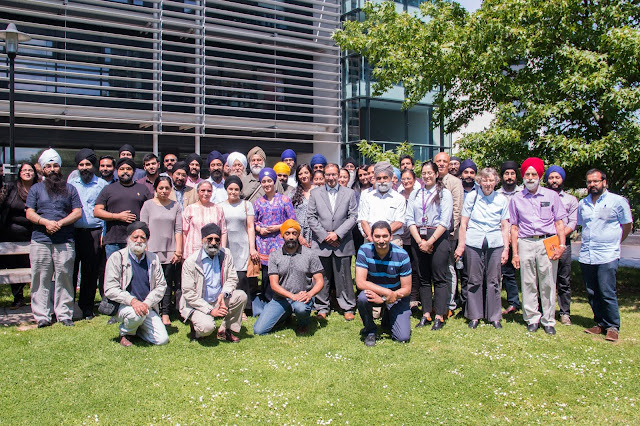 The IRSC organising committee consisted of Dr Opinderjit Kaur (University of Wolverhampton), Dr Jasjit Singh (University of Leeds), Dr Gurnam Singh (University of Coventry), Harbir Kaur Bal ( Phd candidate), University of Warwick, Mandeep Singh Sehmi (Phd candidate), University of Coventry. The participants were also treated to the annual Sikh conference cake as well as refreshments and food throughout the proceedings. There was also a pop exhibition on the Anglo Sikh Wars displayed by the Sikh Museum Initiative. The Sikh community have playe a huge role in making he world a better place. These peaceful and full of life people are an inspiration to us all.